Accessing a walk-in clinic or even your family doctor can be challenging at the best of times. Overcrowding often prevents you from being seen in a timely way – or at all. When we are feeling unwell, whether it’s a chronic or acute problem, we would like to feel we matter and be seen in a welcoming, professional environment. This is how HomeMD can help – when it matters the most, we can offer you care, from evaluation to diagnosis to treatment, in our mid-town Toronto family clinic. This professional service comprises only a part of the full platform we offer; video consultation, home visits and digital medical records round out the platform that makes up a patient-centred health care service beginning with the simple download of our app. This app opens up the world of healthcare and essentially brings it to your door, or device. Join our all access plan for $50 a month you will receive unlimited access to all platforms available – home visits, office visits, digital medical records and telemedicine – video consultations. HomeMD leverages advances in technology to make meaningful virtual consultations possible, without sacrificing personal interaction. Many queries and medical issues can often be resolved through video consultation, but when they aren’t, and for physicals and examinations, the HomeMD clinic is conveniently located in midtown Toronto. Your monthly subscription fee to HomeMD covers unlimited visits to our clinic for assessment and treatment of your medical condition. 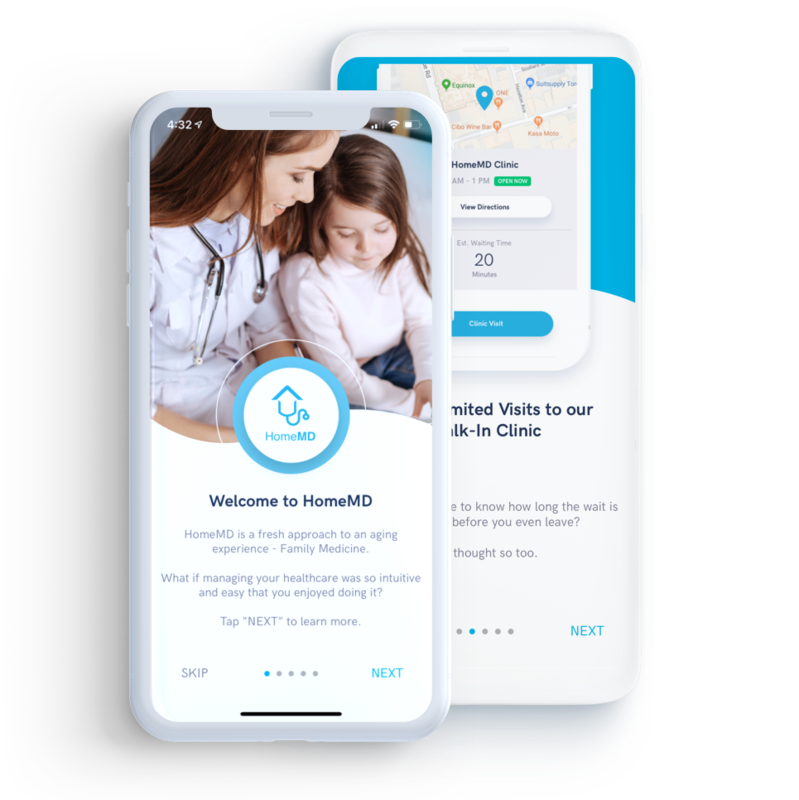 Unlike purely virtual platforms and impersonal automated apps, HomeMD combines on-demand virtual mobile healthcare with an in-person clinical model, assuring patients receive targeted care and individualized support. This level of care, delivered by professional and accredited nurse practitioners, is focused on the patient’s maintenance of good health and ensuring the patient’s health care is coordinated, evidence-based and continuous. HomeMD’s three accessible platforms also reduce the need to conduct internet searches via WebMD-type services that are known to give incorrect or incomplete information and serve only to confound the issue for the patient. Patient-centered care is at the heart of the HomeMD model, with a nurse practitioner-led clinic built on an innovative digital model that delivers comprehensive primary health care — and house calls — wherever you are within the serviced territory in Toronto. Nurse practitioners are proven to provide timely access to high-quality, cost-effective care; these professionals are already delivering primary care to over 3 million Canadians. HomeMD delivers high quality, personalized medicine right to your home. With a simple download of our app, you can access unlimited family medical home visits to help with diagnosis, treatment and follow up care. Our primary healthcare providers offer home visits for health issues that cannot be dealt with easily via telemedicine or a visit to our clinic. Home visits are especially helpful for those who may be less mobile, have transportation challenges or have chronic illnesses that impact the ability to leave the home, whether temporarily or long-term. The unlimited nature of all three HomeMD platforms takes the pressure off the patient. Many patients feel they must condense visits or select only one complaint per visit to share with their primary care provider. Realistically, we know many illnesses have co-morbidities that need dealt with on each visit, including medication concerns and side effects, to name only a few. When you are ill, it can be very hard to make a trip to a clinic. By allowing a caring, professional nurse-practitioner into your home, you are putting your health concerns first and receiving the care you require, in a timely and unlimited manner. Welcome to the next evolution of family medicine in Canada. Now serving the mid-town and downtown Toronto area, HomeMD features a powerful new app offering a unique platform designed to make your life easier and healthier. The new software is the next step in patient-centered care. It reflects our goal to design our family medical practice around you, our patient, and to provide the treatment you need, when and how you need it, whether via telemedicine, unlimited visits to our state of the art family clinic or family medical home visits. Also, access your personal electronic medical record to stay on top of your health in partnership with HomeMD. Secure digital access to all your medical records, including vaccine immunization records;Unlimited home visits by our medical professionals;Unlimited visits to our state of the art medical clinic conveniently located in mid-town Toronto;Unlimited Video Consultations with our medical professionals.